Printed electronics use standard printing techniques to manufacture electronic devices on different substrates like glass, plastic films, and paper. Interest in this area is growing because of the potential to create cheaper circuits more efficiently than conventional methods. A new study by researchers at Soonchunhyang University in South Korea, published in AIP Advances, provides insights into the processing of copper nanoparticle ink with green laser light. Kye-Si Kwon and his colleagues previously worked with silver nanoparticle ink, but they turned to copper (derived from copper oxide) as a possible low-cost alternative. Metallic inks composed of nanoparticles hold an advantage over bulk metals because of their lower melting points. Although the melting point of copper is about 1,083 degrees Celsius in bulk, according to Kwon, copper nanoparticles can be brought to their melting point at just 150 to 500 C—through a process called sintering. Then, they can be merged and bound together. Kwon's group concentrates on photonic approaches for heating nanoparticles by the absorption of light. "A laser beam can be focused on a very small area, down to the micrometer level," explained Kwon and doctorate student Md. Khalilur Rahman. 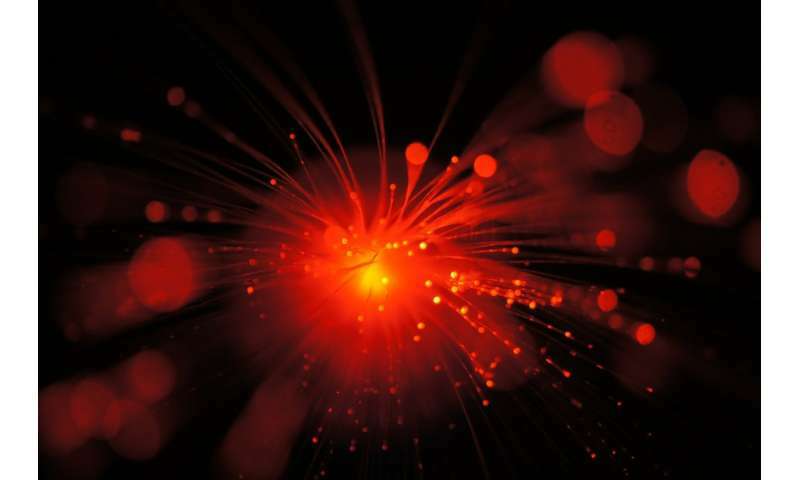 Heat from the laser serves two main purposes: converting copper oxide into copper and promoting the conjoining of copper particles through melting. A green laser was selected for these tasks because its light (in the 500- to 800-nanometer wavelength absorption rate range) was deemed best suited to the application. Kwon was also curious because, to his knowledge, the use of green lasers in this role has not been reported elsewhere. In their experiment, his group used commercially available copper oxide nanoparticle ink, which was spin-coated onto glass at two speeds to obtain two thicknesses. The, they prebaked the material to dry out most of the solvent prior to sintering. This is necessary to reduce the copper oxide film thickness and to prevent air bubble explosions that might occur from the solvent suddenly boiling during irradiation. After a series of tests, Kwon's team concluded that the prebaking temperature should be slightly lower than 200 degrees C.
The researchers also investigated the optimal settings of laser power and scanning speed during sintering to enhance the conductivity of the copper circuits. They discovered that the best sintered results were produced when the laser power ranged from 0.3 to 0.5 watts. They also found that to reach the desired conductivity, the laser scanning speed should not be faster than 100 millimeters per second, or slower than 10 mm/s. Additionally, Kwon and his group investigated the thickness of the film—before and after sintering—and its impact on conductivity. Kwon and his group concluded that sintering reduces thickness by as much as 74 percent. In future experiments, Kwon's team will examine the substrate effects on sintering. Taken together, these studies can provide answers to some of the uncertainties hindering printed electronics.